Day 5 (6/12) – Storms! A severe weather event on Friday resulted in a 16 mile long EF-1 tornado in Lancaster County, Pennsylvania around 8:00 p.m. 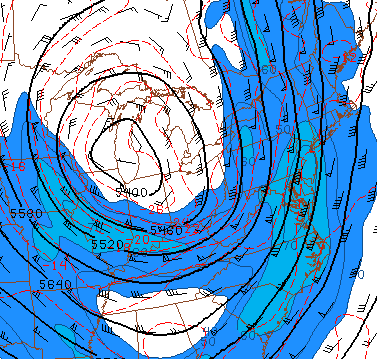 The synoptic setup is rather typical for late-season severe weather events with a deep trough/cut-off low to the west. While synoptic-scale quasi-geostrophic forcing was relatively weak, a small area of modest instability developed in the Mid Atlantic from southeastern Pennsylvania south toward the D.C. area. There was little CIN and a rather potent cold front was moving east through the Commonwealth of Pennsylvania with dew points in the mid 60s near Philadelphia (60 at KLNS prior to tornadogenesis) with mid 40s in central Pennsylvania. That was enough to fire convection and strong deep layer shear helped organize the convection into a powerful QLCS. 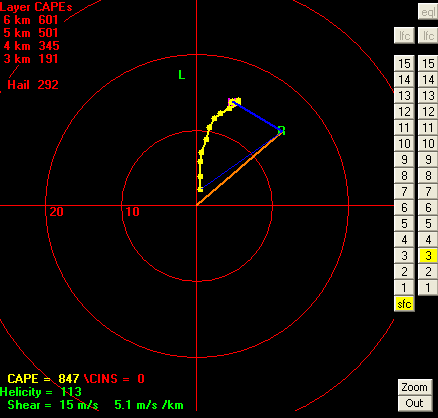 Here’s the 23z RAP initialization for KLNS (Lancaster) at 23Z. The RAP analysis shows just shy of 1000 j/kg of surface based CAPE here in Lancaster about 50 minutes prior to tornadogenesis. While mid and upper level winds were screaming out of the southwest, the winds in the lower troposphere were somewhat unimpressive. 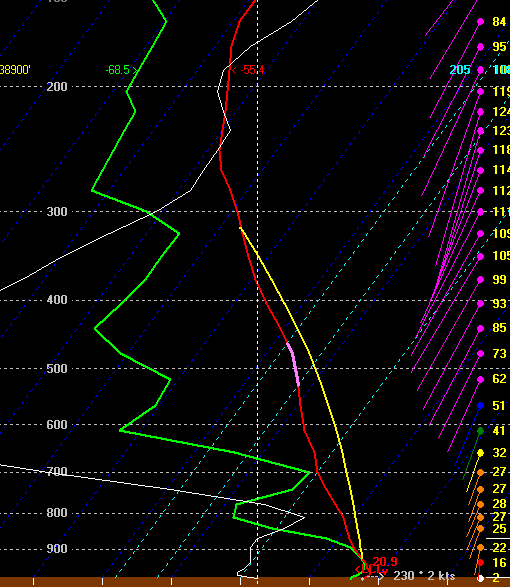 Take a look at this 23z RAP hodograph from BUFKIT and you can see the unimpressive low level environmental shear. Certainly nothing in the low level kinematic field that screams tornado to me! The QLCS developed in a region of low CAPE/high Shear (70 knots bulk shear 0-6km) which is typical of late season northeast U.S. severe weather events. Here’s the radar from KDIX at 2345 UTC and you can see the QLCS with an embedded supercell in eastern York County. The environment was supportive of supercellular structures within the QLCS but what made this storm tornadic once it crossed the Susquehanna? From the above hodograph it’s unclear what pushed this supercell to tornadic. There must have been some maximum in low level horizontal vorticity over Lancaster County to do it. A localized modification in the near-storm environment may have increased 0-1km shear enough? Any guesses blog readers? As the storm’s mesocyclone tightened tornadogenesis occurred shortly after 2350 UTC based on radar (I think the PNS times from CTP are incorrect by about 15 minutes) and hopscotched to the northeast for 16 miles with occasional touchdowns. What made this storm unique is that it provides the clearest example of a tornado debris signature that I have seen in the northeast U.S. since the dual polarization upgrades began. Let’s review some of the dual polarization products before we dive into the details. For detecting a TDS you want to look at both correlation coefficient (CC) and differential reflectivity (ZDR). Correlation coefficient looks at how similar the size and shape of a target is. Uniform drop size or flake size will result in high CC while irregularly shaped and different objects will result in lower CC (hail, biological scatters, or tornado debris). Differential reflectivity detects a target’s shape. Horizontally enlongated targets like big rain drops have a high ZDR while randomly shaped targets (snow flakes or tornadic debris) has ZDR near zero. 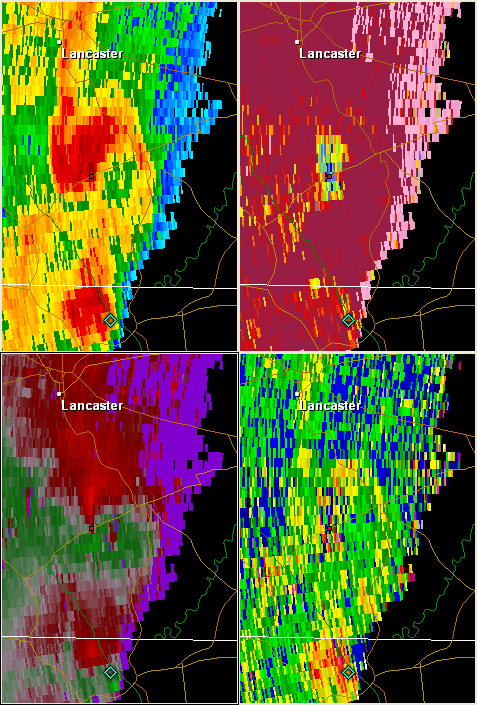 To detect a Tornado Debris Signature (TDS) you need to look for a strong velocity couplet on SRV, very low CC, and near zero ZDR – all co-located The Lancaster County tornado featured a surprisingly long lasting TDS. Here’s a 2354 UTC radar grab from KDIX and you can see a lowering of CC crossing the Susquehanna River. That’s not a debris signature! It appears that there is a bit of small hail that is being detected by the radar. The radar beam is around 9500 ft AGL which is near the 0C level. 2354 UTC KDIX 0.5 Base Reflectivity, 0.5 Correlation Coefficient, 0.5 Differential Reflectivity, 0.5 Storm Relative Velocity (clockwise from top left). No TDS here since the CC lowering is displaced from the velocity couplet. As we move on in time by 2358 UTC you can see a TDS. 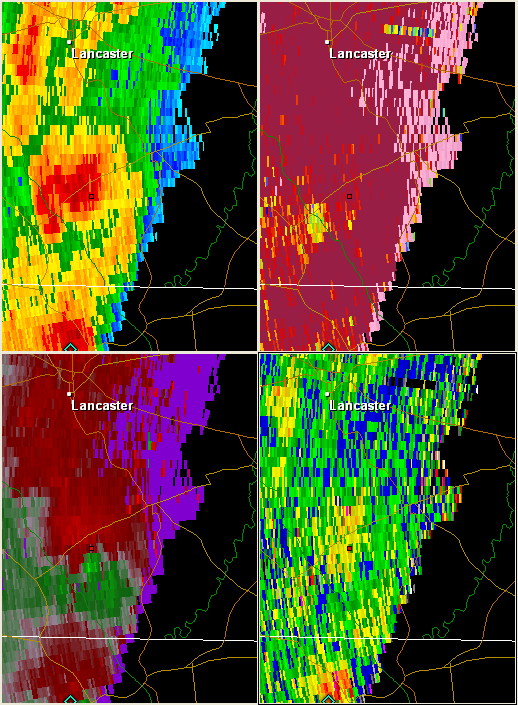 That small area of small hail or graupel is evident just southwest of the TDS but CC dropped dramatically between 2354 UTC to 2358 UTC with values as low as 50% next to low ZDR (near 0) and 65 knots of delta-V with that SRV couplet moving through Lancaster County. 2358 UTC KDIX 0.5 Base Reflectivity, 0.5 Correlation Coefficient, 0.5 Differential Reflectivity, 0.5 Storm Relative Velocity (clockwise from top left). The tornado was an high-end EF-1 with winds approaching 110 mph. The radar beam here is more than 9000 feet above the ground so I was a bit surprised to see the TDS here! Unfortunately, there was no tornado warning on this storm in Pennsylvania (there was earlier in Maryland) even though dual pol was indicating airborne tornado debris. By 0002 UTC KDIX shows the TDS likely embedded within an area of small hail or graupel. The signature persists, though becomes more muted, by 0015 UTC. 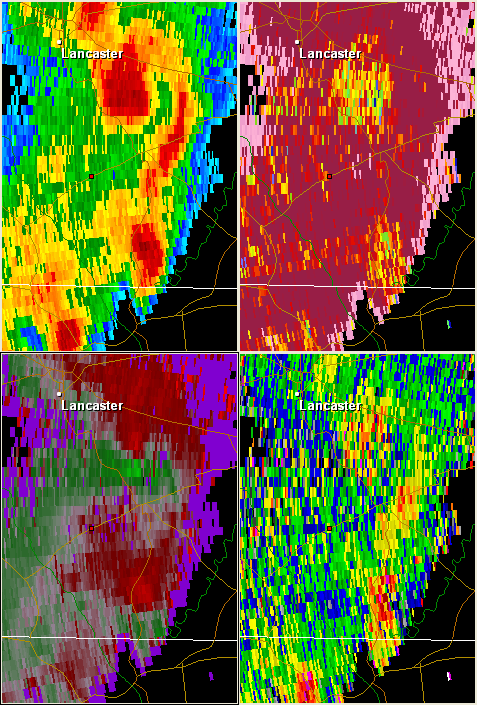 It’s not a huge surrpise that the hail signal on CC was present as the updraft did strengthen through Lancaster County. Reflectivity over 50 dbz occasionally tickled -20C after the tornado touched down. 0002 UTC KDIX 0.5 Base Reflectivity, 0.5 Correlation Coefficient, 0.5 Differential Reflectivity, 0.5 Storm Relative Velocity (clockwise from top left). 0015 UTC KDIX 0.5 Base Reflectivity, 0.5 Correlation Coefficient, 0.5 Differential Reflectivity, 0.5 Storm Relative Velocity (clockwise from top left). From what I could gather from news reports and the NWS CTP PNS the worst damage was near the Susquehanna River in Drumore Township, PA. It makes sense that the TDS was most visible at 2358 UTC and became more ambiguous as time went on. Lancaster County is also rural farm country! This tornado was not moving through heavily wooded area so there’s not necessarily a lot of debris for the tornado to pick up. The radar showed a classic QLCS tornado. The S-shape pattern on reflectivity with an embedded mesocyclone right at the “kink” in the line. While dual polarization cannot increase the lead time of tornado warnings it can play a role when one is on the fence with a tornado warning. In this case, use of dual pol could have been used to issue a torado warning after the initial touchdown. While there would have been negative lead time the warning the word would have been out for people farther northeast in Lancaster County. Dual polarization most likely would have helped the NWS in Gray issue warnings for the 52 mile-long New Hampshire tornado that was only occasionally covered by a warning because of no ground truth reports at the time. If it happened today I bet we would have seen an impressive TDS on radar. 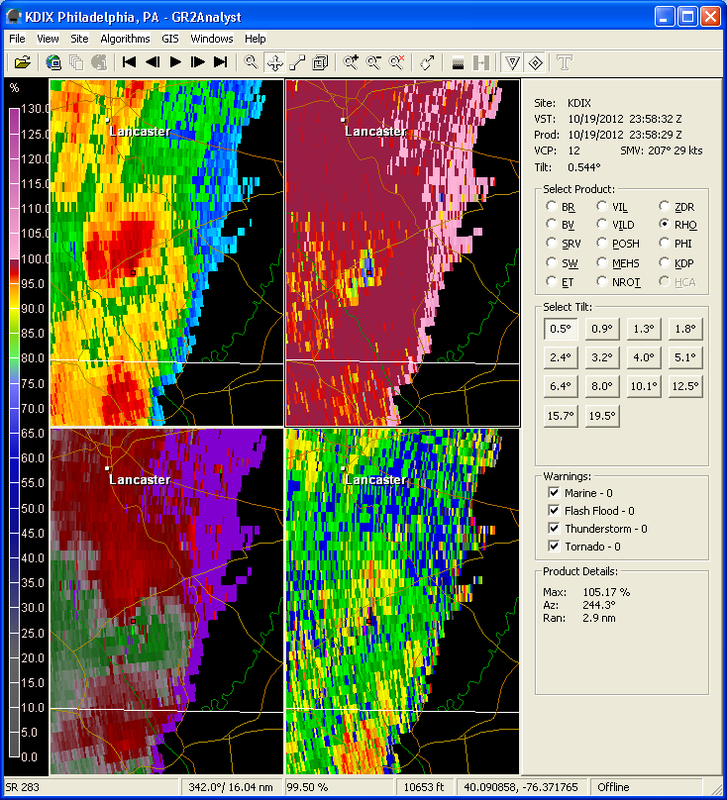 This entry was posted in Uncategorized and tagged Lancaster County, Pennsylvania, tornado, Tornado Debris Signature by ryanhanrahan. Bookmark the permalink. Cool stuff Ryan. I don’t know what 3/4 of that means, but I appreciate your enthusiasm and knowledge and the ability to share it!